El Nutri-Taco is a nondescript food cart at SE 84th and Woodstock. Yes, the one that's parked in someone's front yard. They can also be found on Alberta at 21st. They offer your standard Mexican fare, along with a lengthy and creative veggie/vegan menu. You can visit their rather humorous website to view the menus, and to scoff at the stock photos of Mexican food and happy people. Why do I subject myself to such gastrointestinal strife? The Flamin' Burrito... I mean, what did I expect? Why am I drawn to such foreboding menu items? 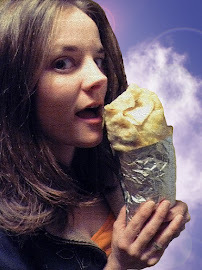 Well, good people, I do it out of curiosity, desire, and most importantly, an eternal love for burritos. Oh yeah, and let's not forget stupidity. I know what you're thinking: "Tofu? In a burrito? WTF! Blasphemy! I'm never going to read this blog again!" Settle down people, settle down. I am open to (almost) all burritos. My first tofu burrito experience, at Dos Gringos in Colorado, changed my life. This is Portland after all, so it's really not that strange. Anyway, on with the review! The first couple of bites were actually rather bland. No fiery spices tickling my tastebuds at all! As I progressed, however, the heat came on. It was subtle at first, but then it kicked me right in the gullet! I was hungry, and wanted to cram it in my mouth faster, but I had to pace myself. By the last bite, my sinuses were nicely cleared. Apart from the heat, the ingredients were rather boring. A better balance between heat and general flavor was needed. The texture was engaging, with chewy tofu, crisp lettuce, chunky tomatoes, and creamy beans, but something was just... missing. To speak straight from my gut, in the end, this burrito wasn't worth the trouble. Will I go here again? Maybe if I'm ever stranded on 82nd St and can't find a Chinese restaurant. Kiko's is located in Sellwood's food cart pod at SE 13th and Lexington. (GONE) I come here from time to time because it's close to where I work, and the burritos are generally pretty darn tasty. If you ever feel like taking a relaxing stroll around a quaint family neighborhood, and getting a good burrito in the meantime, I highly recommend this area. Upon taking my first bite, the words that came to mind were: sweet, salty, and savory. The carnitas was tender and juicy and had a subdued porky sweetness that flourished with each chew. This was complemented by the salty crunch of the grilled peppers and onions. Bite after bite went on this way- carnitas and peppers, peppers and carnitas, with a nice layer of melted cheese and rice nestling it all in place. The pork itself lacked that crisp braised edge that carnitas often has, but I wouldn't say this negated from the burrito's overall texture. As I kept on munching, the carnitas dwindled, and more beans, rice, and pico began to spring up. By the end, it felt like I was eating a different burrito, but lucky for me, it still tasted good. The peppers made it through the entirety, but I only counted 2 bites of mushroom. Not the largest burrito, but just filling enough for a fat girl trapped in a skinny girl's body like me. Will I go here again? Why yes, yes I will. Like the cliche goes: there are 2 kinds of people in the world- those who like La Bonita and those who like La Sirenita. These two restaurants, located between 28th and 29th ave on Alberta Street, have brought about much debate over the years. One is a seedy greasy spoon, the other is a hip hangout. Let's see how they compare in my book! Upon first glance, La Bonita's burrito (on the right) appears more appetizing. The tortilla is flakier, and those little toasted circles are aesthetically appealing. However, it is loosely wrapped, which could lead to a potential burrito explosion! La Sirenita's, though not as visually pleasing, feels solid and well wrapped. A typical relleno burrito, not too eggy, lots of cheese, a little greasy. The pico was tasty, but not very prevalent. Very dense. The chile ran the length of the burrito, which is much appreciated. What could be worse than not getting to the chile until you're halfway through, or running out of it at the end? The tortilla was lacking, and a little on the sticky side. It wasn't super flavorful, and needed salsa to keep it interesting. Good price for what you receive though. It started off well. The chile was stuffed with white cheese, perhaps cojita, which was creamy and delicate. The beans were also pretty tasty. As I kept on chomping, however, lettuce began taking over, until nearly every bite was a mouthful of iceberg. This isn't acceptable for a burrito pushing the $6 mark, or any burrito for that matter. In the end, it wasn't very gratifying and needed lots of hot sauce to keep it alive as well. La Sirenita pulled out ahead! The cheaper price and lack of lettuce is what gave their burrito an extra half star. Ho hum, but neither of these burritos rocked my world. Both were totally uninspiring. I know there will always be die-hard fans of both places, and perhaps I just ordered the wrong burritos. As for now, I'm left feeling empty and destitute. I suppose I'll just settle down in my little hole in the world and wait for the next burrito craving to hit. Perhaps I should open my own taqueria, and call it: "The Beautiful Little Mermaid" (La Sirenita Bonita). It will be a magical place where everyone just gets along.